A hybrid cloud world means a massive amount of data is constantly being generated. Traditional storage systems were not designed to effectively handle this amount of data, meaning valuable data is hidden or overlooked and resources are strained. Intelligent storage systems remove these barriers that keep customers from taking advantage of their data. As customers leverage artificial intelligence to fuel their digital transformation, implementing a proven data protection strategy is crucial to ensure maximum data Availability. Hewlett Packard Enterprise (HPE) and Veeam® have partnered to deliver unique capabilities for Intelligent Data Management. Veeam’s Availability Platform for virtual, physical and cloud-enabled deployments offers an end-to-end data protection solution that changes the way you manage data to make it smarter, self-governing and always available. The integration of Veeam software with key HPE Storage Systems means that protected workloads are now ultra-resilient to data loss. 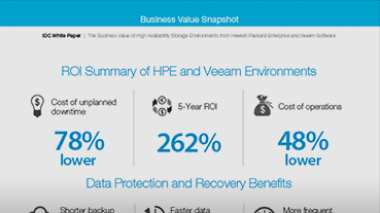 Learn more about the ROI benefits of leveraging HPE and Veeam for Availability Solutions. 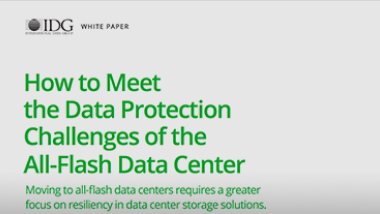 Learn how to meet the data protection challenges of the all-flash data center. 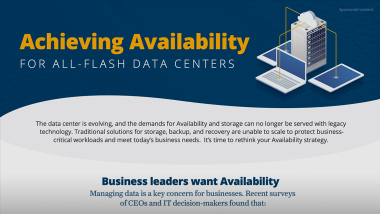 Learn more about the benefits of switching to all-flash and why a proven data protection strategy is needed. Flash-accelerated data protection, faster backups with near-zero recovery time objectives (RTOs) and improved recovery point objectives (RPOs). Intelligent operations allow you to predict, prevent and resolve cross-stack performance issues before they impact business and cut out the guesswork in planning. Ease of management and an infrastructure that practically manages itself eliminates the need for dedicated backup administration and overcome legacy solution deficiencies. With explosive data growth, dynamic business requirements resulting in shrinking SLAs and reliance on Digital Transformation, a proven data protection strategy is crucial to business success. With customers facing limited budgets, they are looking for economic ways to maximize application Availability. 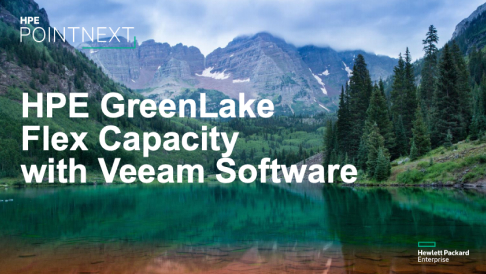 Purchasing Veeam through HPE GreenLake Flex Capacity delivers a proven Intelligent Data Management solution with no upfront costs. The pay-per-use model eliminates the need for overprovisioning, while also assuring supply as business needs grow. Customers benefit from simplified IT and faster time to value, while maintaining control of an on-premises solution. Learn about how HPE Greenlake is helping enterprises save on overprovisioning costs. 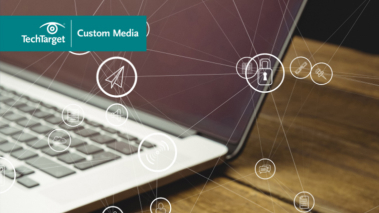 Learn how consumption-based data management is providing peace of mind. HPE & Veeam offer an integrated data protection solution for your data management needs. 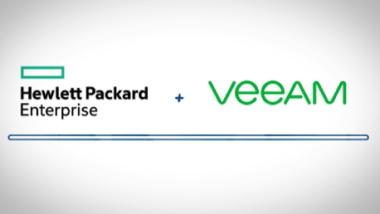 Veeam is now available through HPE GreenLake Flex Capacity providing customers with a simplified IT experience, decreased costs, and increased agility. Decrease costs by only paying for capacity you need, increase employee productivity and agility. 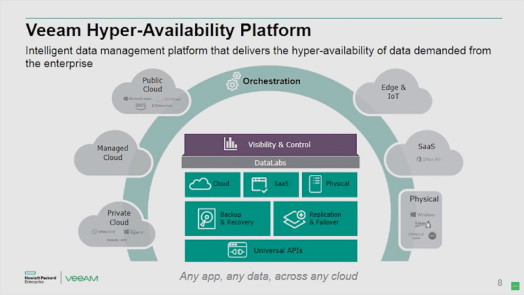 HPE takes over infrastructure management, maintenance, firmware upgrades, etc. ; while Veeam provides a single-pane-of-glass solution to easily manage all of your data, regardless of where it resides. As customers are finding creative ways to optimize their IT investments, they are utilizing a mix of HW solutions, as well as virtual and physical infrastructures on-premises and in the cloud. 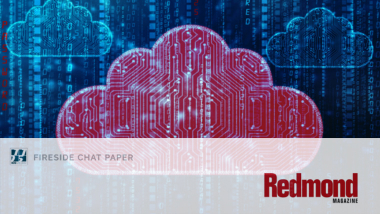 As more workloads are being treated as business-critical, it is crucial to keep applications up and running while completing application item restores. Additionally, due to compliance regulations and cost benefits, some customers require backup-to-tape options for long-term retention. 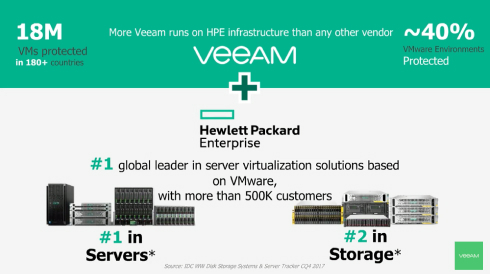 HPE and Veeam are joining forces to provide HPE SimpliVity customers with a single pane-of-glass data-protection solution providing simplified data management across heterogeneous environments, extending from on-premises to the cloud and more; with the ability to provide granular application item restores. 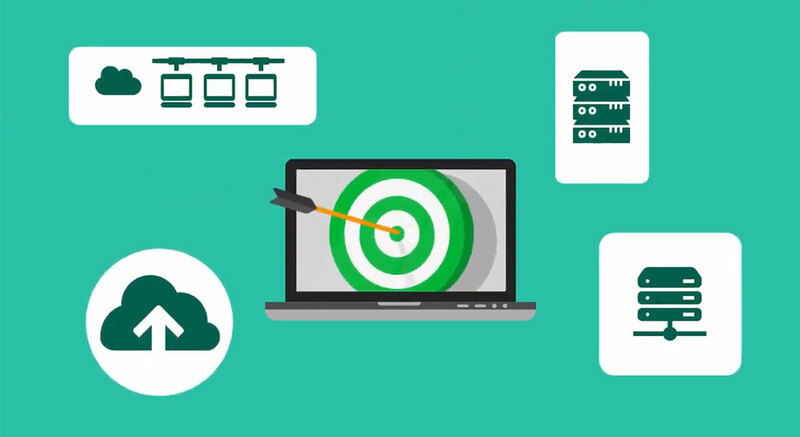 Watch our whiteboard video to learn more about the benefits of partnering with HPE and Veeam. 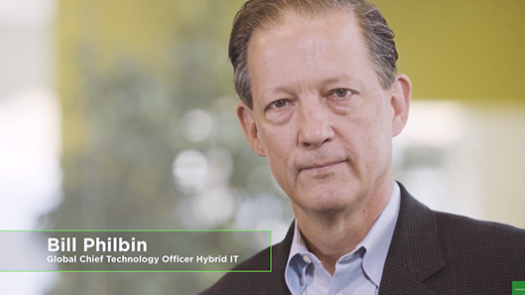 Read more on how HPE + Veeam can help you maximize hybrid IT Availability. 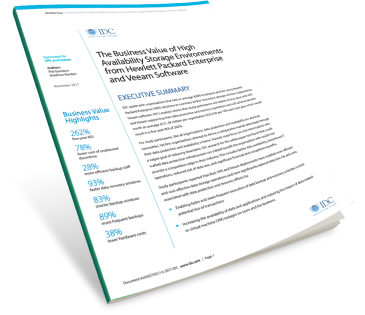 Check out our white paper for more information on how to achieve organizational cost savings and increase business agility. Combine Veeam with HPE SimpliVity for a single-pane-of-glass data management solution across mixed environments and into the cloud. Ensure data availability across all workloads and environments. Decrease costs of downtime and increase employee productivity. Veeam provides a single-pane-of-glass solution to easily manage all your data, regardless of where it’s located. We conduct more than 12 million background checks each year to help employers find qualified candidates, and Veeam and Nimble support us every step of the way. We were attracted to Nimble because of its data encryption capabilities. We also needed a flash-accelerated storage solution that offered our customers better performance at an economical price point. HPE Nimble Storage was the ideal choice.